Barcelona is known for its endless array of gastronomic delights! From the local produce found in the city’s markets and the typical ‘Menú del Día’ to rustic feasts and free tapas, there is something for everyone in the Catalan capital. You surely will not go hungry during your stay! The most difficult decision will be where to eat in Barcelona as there are so many fantastic options. What you may find is that, like any large European city, dining out can come with a hefty price tag. But if you’re coming to Barcelona on a budget, don’t worry as we have prepared a short guide to eating out for cheap in the Catalan capital. 1. Try to avoid the typical tourist restaurants located in the central areas of the city. For example, many of the streets leading off Las Ramblas offer food for exorbitant prices and with very poor quality. It’s better to venture a little further off course where there is better food at a lower price. 2. Live like a local in Barcelona! Look out for the classic ‘Menú del Dia’ which is a set menu of two courses, a dessert, bread and a drink. Prices range between 8€-15€. 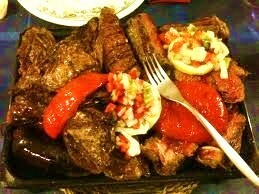 The portions are typically very generous and the Menú is a great way to sample regional cuisine. This is a classic among residents and a great way to eat cheap in Barcelona. After a couple of hours of sightseeing and shopping, you might need a little snack to refuel. 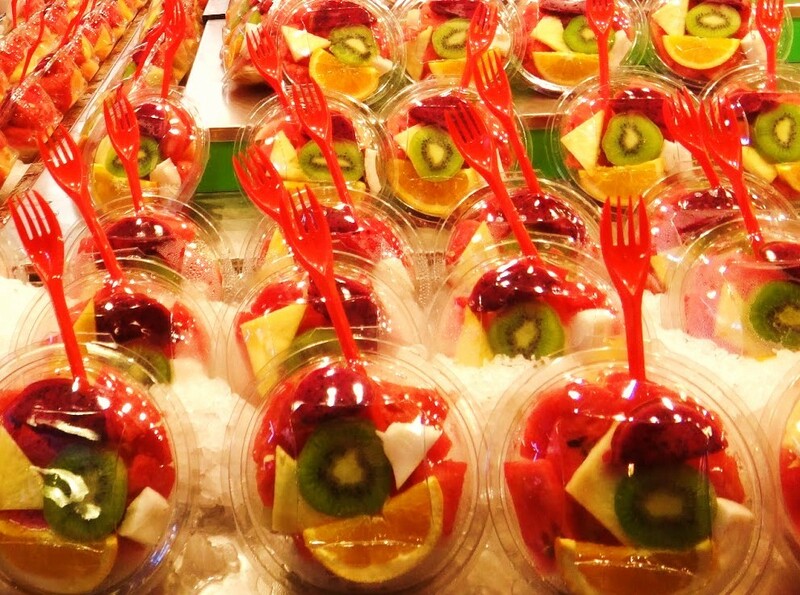 We recommend heading to the renowned Boqueria Market on Las Ramblas. This is a great way of combining a true Barcelona experience with a delicious pick-me-up. Top pizza spot Eslice is a must. Perch on a stool among locals and indulge in some tasty, rustic bites. Here you can also grab an all you can eat deal for groups of two or more for 8€ per person, just make sure send them an email or call to confirm your arrival. 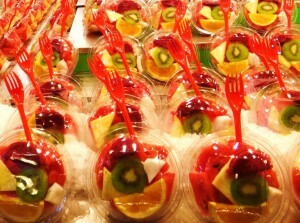 Or, if you want a refreshing snack, pick up an exotic fruit cup from the many stalls in the market, costing around 2€. 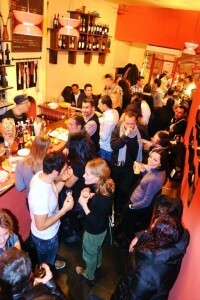 A few rounds of free tapas in Barcelona is a great option for dining on a budget in Barcelona. Head to Gata Mala in the bohemian Gràcia neighborhood and enjoy free tapas with a drink. The same goes for Café de los Angelitos in Barceloneta, which is a lively hangout next to the beach. There are many more bars offering free tapas in Barcelona, so keep an eye out while on your travels. Sightseeing in Barcelona can take its toll on the stomach! 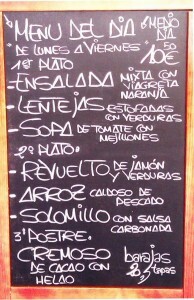 But heading over to one of the following cheap eateries in Barcelona means you can be sure that you’re in for a feast! Meat lovers, be sure not to miss out on La Rueda, located close to the Diagonal metro station on Carrer de Roselló, 266. This rustic grill offers a never-ending menu with every cut of meat you can imagine. If you’re having trouble deciding, then try the special 30€ meat platter for two – incredible value for money! 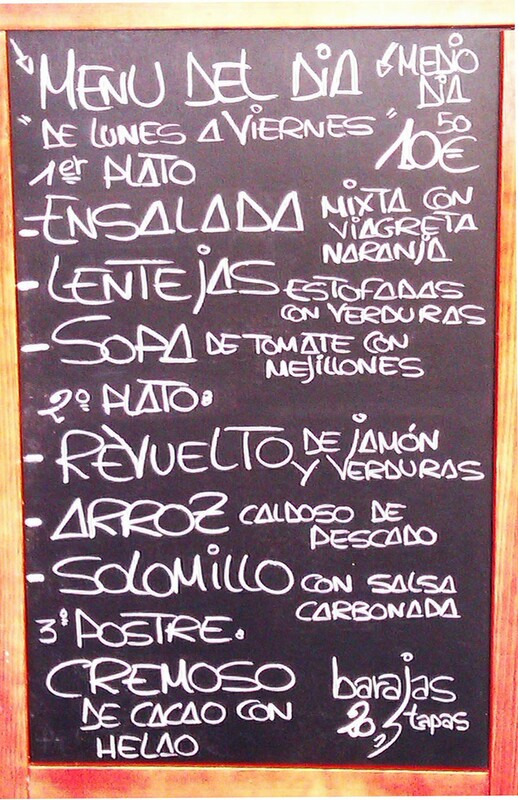 If you prefer a larger meal in the afternoon then try their three course lunch time menu for 9.95€. The food is here amazing and really is a true feast! Gràcia’s traditional Catalan tavern El Glop, located on Carrer de Sant Luis, 24, is an ideal place for those who want to taste amazing local cuisine. 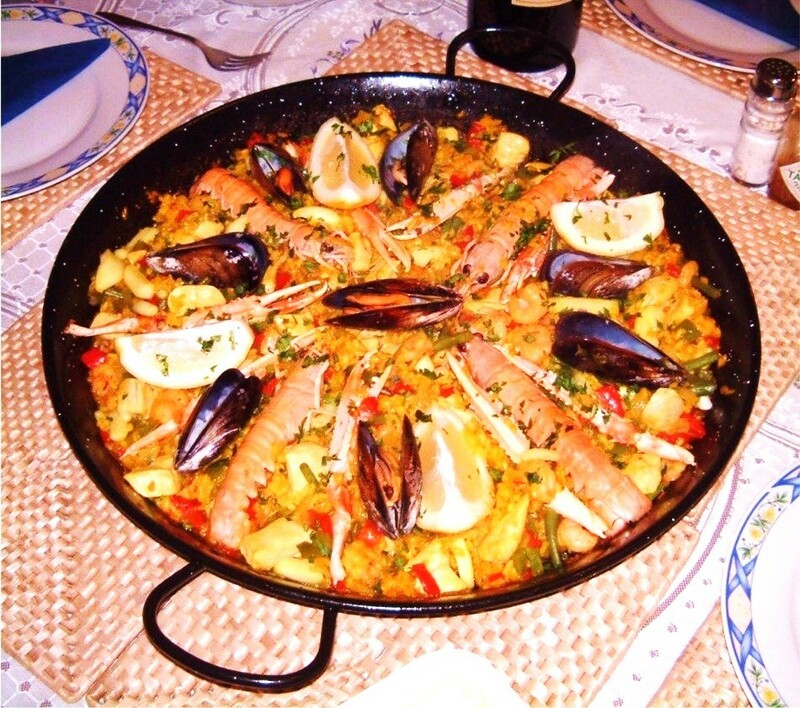 From the traditional jamón, to fresh fish and paellas, there is something here for everyone. The dishes are really authentic and the quality very high and you can expect to pay around 15€ which is very reasonable. If you like all-you-can-eat style buffets then head over to one of the six FresCo restaurants located all over the city. Prices range between 9.95€ – 12.95€ per person depending on the time and location. At times it’s hard to imagine, but it’s not just about patatas bravas and tortilla in Barcelona. There is a wide choice of foreign cuisine available too, as well as lots of quirky spots to dine at. The fantastic bar Petit Jet Lag on Carrer de la Dagueria, 12, is a great place to head to on a Thursday night, when their brilliant Aperitivo Italiano takes place. Buy a drink and then eat all you want from their amazing free buffet! Or maybe you fancy something a little lighter? An exciting salad or delicious sandwich perhaps? Fo Bar is the place for you in that case! Found in Plaça Osca, a small square near Sants Station, it is colourful and inviting and a favorite among locals. With a relaxing atmosphere and delicious food for an average price of 4€ it’s no surprise! So now you know! Impress your friends with your insider knowledge and head to some of these great eateries in Barcelona. You’ll be sure to have some change in your pocket afterwards – more money for enjoying the amazing sights of Barcelona! This entry was posted in Home, Restaurants & Food, Tourist Guide and tagged Barcelona food, barcelona food and drink, barcelona nightlife, barcelona restaurants, barcelona tourist guide, cheap food in barcelona, eating out cheap in barcelona, eating out in barcelona, La Boqueria, Restaurants in Barcelona, tapas in barcelona, tourism in barcelona, visiting barcelona. Bookmark the permalink.